A stylish Christmas wreath ornament made from wicker with a central dangly tree. 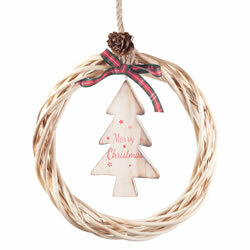 21cm in diameter, excluding the jute string hanger. Ideal for a rustic and traditional theme.